We bring forth a huge range of enamoring metal handicraft that exhibits the intricate craftsmanship of our experienced artisans. We stand in the midst of overriding brass handicraft manufacturers, based in India. 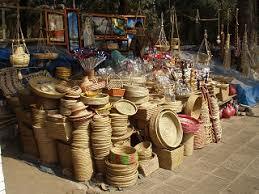 This Indian handicraft is highly acclaimed in national market for its peerless designs and high quality. They are manufactured from the superior quality raw materials keeping in mind the various quality standards. These decorative Indian handicrafts provide a scintillating look to your interiors, with their exquisite designs.